KIEV, Ukraine -- Conflict at the highest levels of the Ukrainian government has become so sharp in recent weeks that the battles have turned public and the fights have gone viral, as the jostling for power undermines efforts to deal with war, corruption and a nose-diving economy. 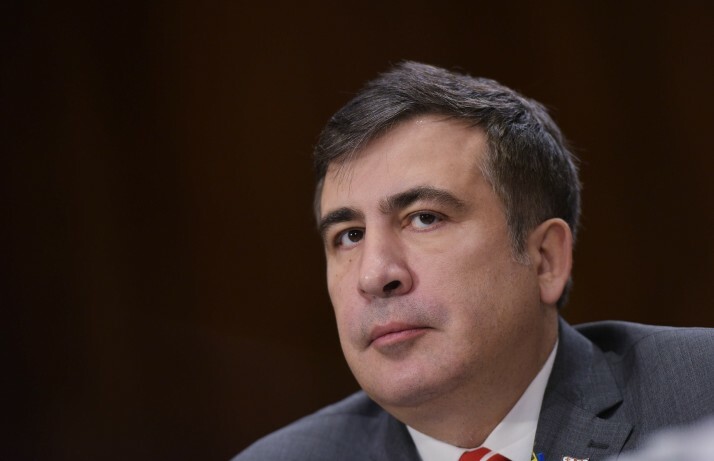 The former president of Georgia, Mikheil Saakashvili, is today's governor of Odessa. The tensions tearing apart Ukraine’s ruling classes was full display at a meeting of Ukraine’s reform council, which turned into a shouted exchange among top officials. The spat showed Poroshenko was unable to command authority among his colleagues, who are engaged in an often literal fight to the political death. They’re warring over the whether Prime Minister Arseniy Yatstenyuk, whose popularity has dropped to the low single digits, should stay, and what role, if any, Saakashvili should play at the top of Ukrainian politics. But despite the unusual statement, pressure continues to grow on Yatsenyuk. A vote of non-confidence in the prime minister is likely in the New Year. Oleg Barna, an MP who tried to lift Yatsenyuk off his feet and bodily carry him out of parliament a couple of weeks ago — providing another viral sensation — is said to have gathered 90 of the necessary 150 signatures required to call such a vote, according to parliamentary sources. According to Taras Berezovets, a Kiev-based political analyst, parliament is headed for paralysis. Early parliamentary elections in 2016 now look likely, he said, the question is when: spring or autumn. Based on current polling, elections would result in a far less pro-European coalition, with eastern-leaning opposition parties such Opposition Bloc and Renaissance doing well. A poll conducted by the Rating organization in October suggested they would get nearly a fifth of the vote. The likeliest to benefit from early elections is Saakashvili, Ukraine’s most popular politician. Publicly, the Georgian has said he isn’t interested in becoming prime minister. Privately, however, his backers say that’s what he’s aiming for — “Or, at the least, vice premiership in a government without Yatsenyuk,” said one ally who asked to remain anonymous. Such an appointment would be opposed by many Ukrainian politicians, weary of Saakashvili’s ability to disrupt the status quo. It would also worsen the already terrible relationship between Moscow and Kiev. On December 13, Saakashvili launched a new anti-corruption initiative in Odessa, the port region he has governed since May. He renewed his attacks on Yatsenyuk’s government, accusing it of “covering up for $5 billion of corruption in government companies” every year. Mustafa Nayem, a reformist MP also associated with the Saakashvili ticket, addressed the speculation in a Facebook post. If anything, however, the tempestuous Georgian’s ties with Poroshenko also appear to be fraying. The Georgian is a problem for Poroshenko. On one side the independent and popular Saakashvili upstages him, but on the other the president continues to need to be associated with Saakashvili’s popularity. In the same way, Saakashvili continues to need Poroshenko’s power.